Well, that’s awfully disappointing. Although last week’s episode indicated that Gracepoint was about to take a radical departure from its predecessor Broadchurch, this week we’re pretty much right back where we started. Although I still don’t think there’s any way we can be pointing to the same original murderer, now, apparently, all bets are off. In our new plotline (possibly just brought in to drag out Gracepoint for two extra episodes to ten from Broadchurch’s original eight), Tom has returned after his ill-fated journey to find Lars Pierson the mysterious backpacker. For an 11-year-old, seemingly intelligent boy, his plan doesn’t make a whole lot of sense: Why would anyone go confront a murderer by himself? If Lars was in fact the murderer, wouldn’t that be an excellent way to get killed? But we can chalk this up to Tom’s desire to be the hero and solve the case, getting his mother back in the bargain. Tom’s need to mend his family is part of a larger theme this week, as we see more than a few families broken and mended. For all of Owen’s wrongdoings as a stubborn reporter, he’s still Ellie’s nephew, so the first shot we see of him is taking care of baby Dylan. The unofficial family of Gracepoint residents effectively casts out nasty reporter Renee, now forced to sleep in her car. Beth Solano wants to meet with the mother of the girl who was killed in the Rosemont case, who offers a terrifying picture of an actual walking dead life, framed by alcohol, pills, TV, and sleep, on an endless, painful cycle. This mother’s life is gone as well (“I can’t come back from that”) and Beth cries as she witnesses a possible futile and painful future for herself. But fortunately after that, Beth is faced with her remaining child, Chloe, in crisis, and she and Mark decide to act like parents again. Their bowling session is a bit too frantic after all the sorrow they’ve gone through (maybe that’s why), and breaking Danny’s bowling record a bit too symbolic of the family’s need to move on. But in the end, Beth decides to keep the baby. Life continues, no matter what. It’s that kind of hope that Carver and Paul the priest argue about in the episode’s most interesting scene: the difference between suspicion (Carver) and faith (priest). Sure Paul’s been some kind of camera-magnet since Danny’s death, but likely because he feels like the town needs him for the first time. The pews in his church are filled, unlike his old status as “that building that no one goes into,” as Carver chides him. Because people need hope at a time like this, they are embracing Paul’s church. At the same time, Carver becomes more and more of a town outcast, because he represents what the townspeople don’t want to face: suspicion, and the fact that the murderer still walks among them. Paul calls it, correctly, “a fear you couldn’t address.” All Carver can do here is catch the killer: the damage has already been done. From Beth’s perspective, we see what happens when a case does not get resolved: Part of Nina’s mother’s anguish is that there was never any justice for her poor daughter. This unfinished element, and uncertainty, keeps her in this sort of arrested state of development, with no peace or relief to be found. While this Rosemont disaster has affected Kate physically, it’s also affecting Carver: Actually, it’s killing him. When someone dies, especially in such a tragic manner, just going on with your life might first appear like a rejection of that person. Nina’s mother has effectively tombed herself up as much as her departed daughter. Beth makes the decision to start living her life again, as do Mark and Chloe (Chloe even asks Danny to forgive her as she breaks his record). It’s not a rejection: these people wouldn’t want us to give up our lives for them, and it’s not like we will forget them. As if we ever could. So overall, another well-done episode, but I really was looking forward to seeing how Gracepoint was going to build of the Broadchurch base into something newer. There are a few introductory elements: Lars the backpacker, and that crazy spider-bite story from Mark was too random not to eventually mean anything. (It’s more likely that Danny did get clocked by someone, either Paul or Tom, on the Sunday School overnight trip.) 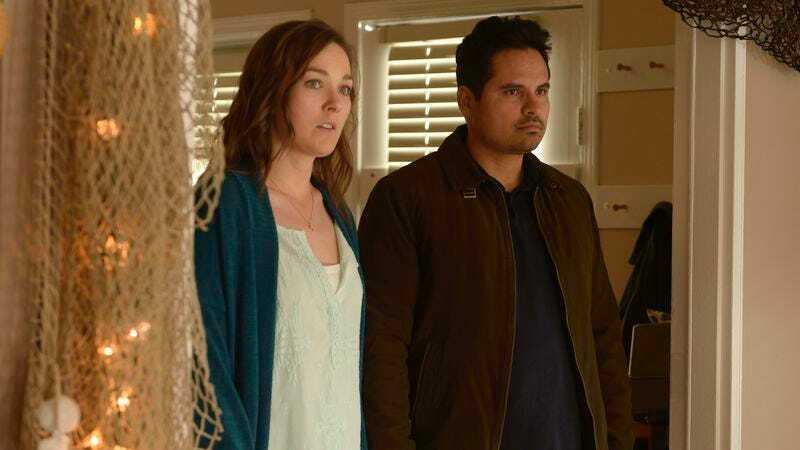 I like the Gracepoint-only characters like Carver’s daughter Julianne and the savvy drug dealer Mickey that showed up in previous episodes. But all the other pieces are in place: Carver’s heart attack, Susan’s shady past (good thing going through 25 years of paper or microfilm archives didn’t take that long), Vince’s kidnapping of the dog. Can Gracepoint possibly reshuffle these pieces into a brand-new conclusion with its two remaining episodes? It’s a tall order, but maybe, as Ellie suggested, there’s more going on underneath than we realize. I dislike Paul the priest a lot, but I don’t think ever as much as when he was singing hymns during the search party. Significant milestones: Both Emmett and Ellie call each other by their first names this week. Most likely suspect this week: Because of that bizarre spider-bite story, it looks like there’s some horrible connection between Danny, Tom, and Paul the priest.